This carrot cake recipe is so moist and tender. It's made with vegetable oil instead of butter. It's spiced up with some cinnamon and nutmeg too. 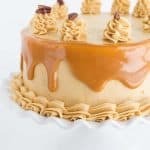 The frosting is a swiss meringue buttercream with a caramel sauce added to it. Plus, sandwiched between each cake layer is even more caramel! Preheat oven to 350 degrees. Spray nonstick cooking spray on three 8-inch round cake pans. Dust with flour. In a large mixing bowl, add in the granulated and brown sugar, cinnamon, and nutmeg. Mix until combined. Add in the oil. Canola oil would also work. Mix on medium until combined. Add in the vanilla and the eggs. Mix on medium until the eggs are incorporated. In a separate bowl, sift together the flour, baking soda, baking powder, and salt. Pour the dry ingredients into the wet mixture. Mix on low until the flour is almost completely incorporated. Turn up to medium and mix for another 30 seconds. Add the carrots and stir until incorporated. Divide the batter into the cake pans evenly. Place in the oven for 33 to 35 minutes or until done. Place a toothpick in the center of the cake and if comes out clean or with moist crumbs it's done. Let the cakes cool for 10 minutes and then turn out onto a wire cooling rack. Let the cakes cool completely. In a double boiler, add the egg whites and granulated sugar. Make sure the water isn't touching the bottom of the mixing bowl holding the egg whites and keep the water to a simmer. Stir until the sugar is dissolved. This is when the egg whites reach about 160 degrees. I test to see if the sugar is dissolved by dipping my impeccably clean finger into the mixture and feel for grit. Pour into the stand mixer bowl and whip with a whisk attachment on high. The meringue needs to come to stiff peaks. If you turn the whisk upside down and the peak stands up, you've reached the stiff peak stage. Add the powdered sugar and mix until combined. Add the shortening and butter to the mixture all at once. Beat until it all comes together. It will thicken up at this point. If the mixture looks like it curdled, keep mixing. It will come back together. Add the vanilla and caramel sauce. Mix until combined. In a microwave-safe bowl, add in the caramel squares and heavy cream. Microwave for 30 seconds and stir. Repeat the intervals and stirring until it's creamy and smooth. Place a layer of cake on the bottom of the cake plate. Spread an even layer of buttercream on top of the cake. Drizzle 1 - 2 tablespoons of caramel sauce on top of the buttercream. Keep the caramel about an inch away from the edge. Repeat the steps with the next layer of cake. Add the last layer of cake on top. Pile buttercream on top of the cake and spread it evenly on top of the cake and begin to push the excess buttercream down the sides. Add more buttercream to the sides and spread it out until it's smooth. Add the leftover buttercream into a disposable piping bag with a 1M tip. Pipe swirls of buttercream on the top of the cake. Pipe shells around the bottom of the cake with the same tip. Place the caramel garnish into a disposable piping bag. Add the caramel along the edges of the cake. Let it drip over the edge. Once you're happy with the amount of caramel and the drip, place it in the fridge to set up. Remove from the fridge and let it come to room temperature. Cut and serve. Place the cake back in the fridge to prevent the caramel from continuing to drip after it comes back to room temperature.